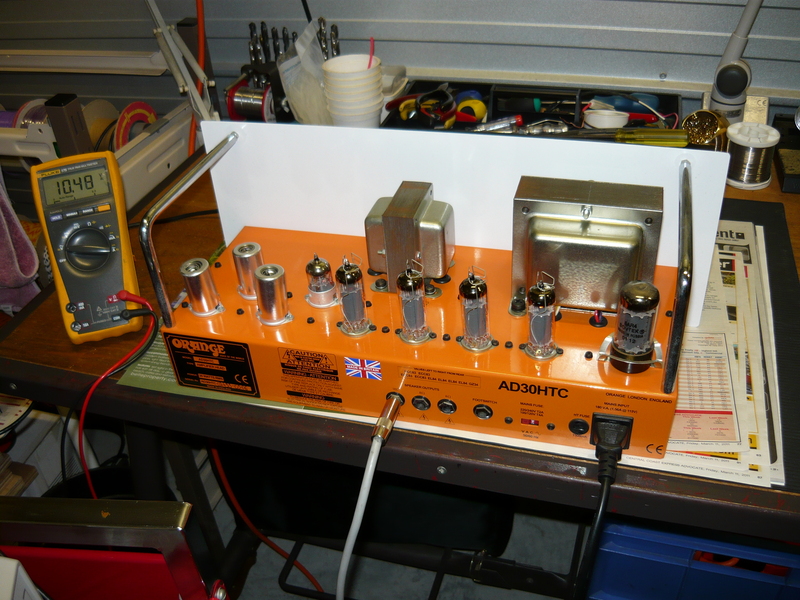 As well as building my own amps, I also service most brands of musical instrument ampifier, in particular those empoying valve, ie tube technology. 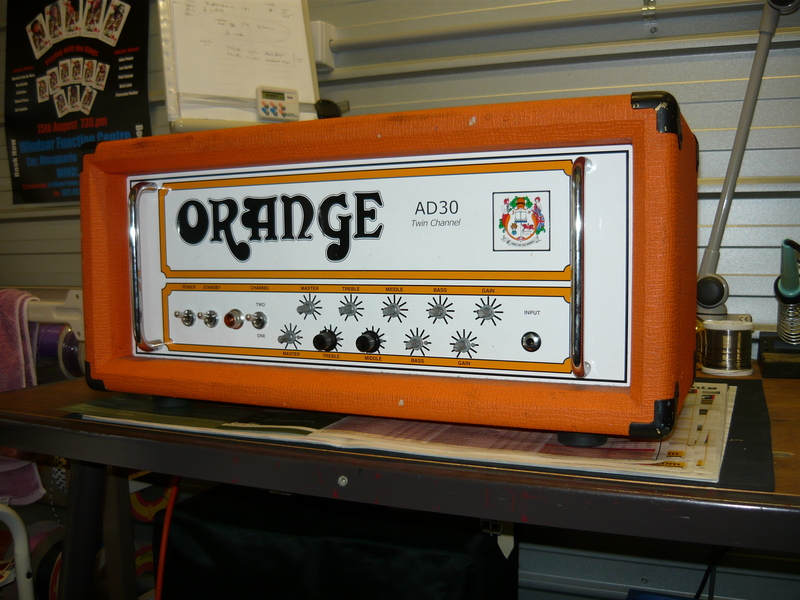 As an example here is an Orange (made-in-UK) AD30 amp that has had a hard working life and arrived at the workshop with blown fuses, missing control knobs, and general wear & tear from life on the road. Orange amps have always enjoyed a higher standard of construction & assembly than many commercial brands, going right back to the late 60’s. Originally they were a fairly clean, bright & very loud sounding amp favoured by the blues/rock players of the time, but more recently they have developed a more grungy flavour, very “British” in character. Orange also produce an all-valve 200 watt bass amp head utilising a quartet of 6550 valves, which is worth checking out. This amp required a re-valve, replacement of fuses, replacement of missing knobs, cleaning of pots & jacks, a general tighten up & clean up, and most importantly an electrical safety check. Every amp that is serviced in my workshop undergoes electrical safety inspection and testing as described in the Australia/New Zealand Standard AS/NZS 3760, and WorkCover NSW Code of Practice. The repair work having been completed, the amp is subjected to a power output test and a burn-in test, connected to an appropriate load, eg a THD Hotplate device, and monitored on an oscilloscope and true-rms reading digital voltmeter (DVM). Finally, the musician in me takes over and the amp is connected to my workshop speaker and I give the amp a final play test. After having cooled down, the amp is boxed up and returned to the customer in Sydney, ready to rock & roll !! More amp repair examples to come as time permits – IR. This entry was posted on May 13, 2011 at 11:44 am and is filed under Amp Repair. You can follow any responses to this entry through the RSS 2.0 feed. You can leave a response, or trackback from your own site.